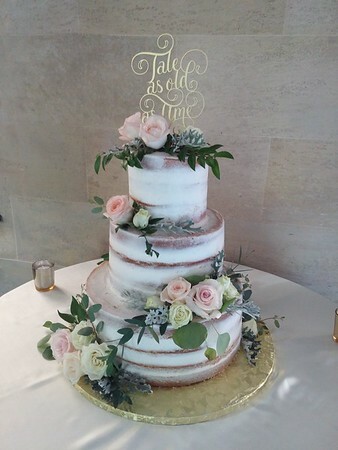 Wedding cakes are one of our specialties with 20 years of experience and thousands of wedding cakes since 1997 we can offer a wealth of expertise. Simply put, we offer the best value, product and service in the Sarasota area. I encourage you to explore other vendors, taste their product, consider there pricing, and research reputations before speaking with us. This private owned and operated single bakery business has seen many competitors come and go throughout the years. Our success has been simple... quality, taste, service, and focus on detail. Our cake is super moist with incredible fillings, clean (no fondant) porcelain like finish and all buttercream designs. Yes, fruit fillings and lots of great mousse fillings unlike the fondant cakes with just flavored buttercream fillings. Yes, super moist cake not dry dense cake like fondant cakes. Yes, smooth silky buttercream not gummy thick rolled fondant. Our galleries show photos of all client inspired designs. That's what we do, full custom work, any cake flavor and fillings throughout, any colors, motif, style, and look. With smooth buttercream we cannot do everything but, we are masters of this and majority of the time we can make a better product in buttercream than fondant. "Brides on a Budget" or BOB cakes are pre-designed wedding cakes with few option choices other than flavor and color changes. These multi tier cakes are priced at $4.50 per serving. Designed for those brides that are not looking to dive into the design / selection process and simple want a pro quality cake at a budget price. We do not offer tastings for these cakes. 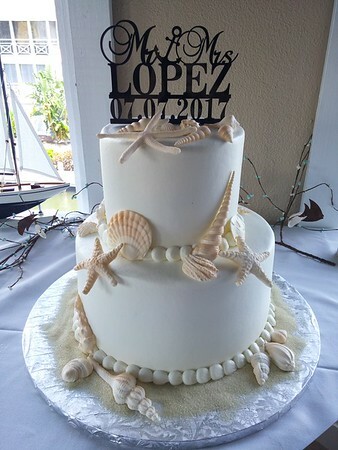 "Custom" wedding cakes begin at $5.00 per serving and typically do not exceed $6.00 per serving. Our quote is for any cake flavors and fillings throughout as well as custom color matching. 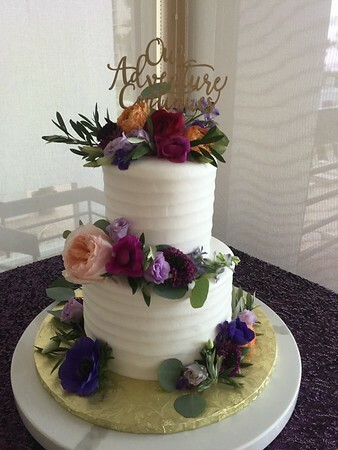 The Bride is required to supply cake toppers, ribbons and fresh flowers to the bakery. 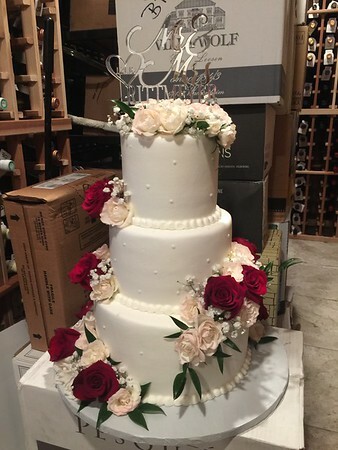 We apply, deliver, and set up the completed cake to the venue in place for the wedding. Delivery begins at $45. Sunday weddings must meet the $500 cake minimum. Custom wedding cake tastings are offered by appointment free of charge for weddings with 85 guests or more. We offer two tasting plates and cannot accommodate more than three guests. Normal tasting appointments are booked Tuesday thru Thursday between the hours of 1-3 pm. Outside of normal hours, appointments are only booked with $25 sitting fee paid at the time the appointment is set on the calendar. The fee is NON refundable and compensates the bakery for the after hours time invested. We typically do NOT book tastings on Friday and Saturdays like other vendors. During these busy times, we are solely focused on executing our contracted business and simply cannot push aside our attention to book new business. There sometimes the opportunity for a weekend tasting is we have a slow weekend. 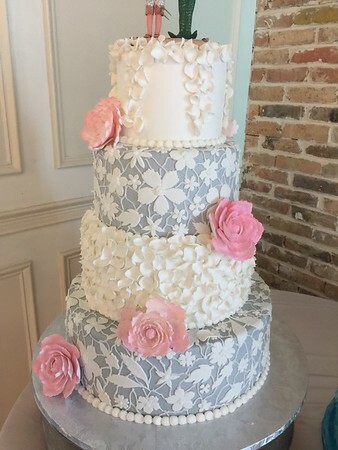 We may not be the right choice for your wedding, explore your options and speak to other wedding professionals about cake vendor recommendations. If we do earn your business, you can be assured to receive the attention to detail and quality product we so proudly have built our reputation on.